Mismaloya is located just 5 miles south of Puerto Vallarta off Hwy. 200, the main road along the ocean. Remodeled in 2009, condo with all marble floors throughout. Full kitchen, air conditioning, phone, fax, satellite TV, housekeeper, property manager/concierge on site, dining room seats 6. One bedroom (king bed and 2 long couches-twin bed size) and 2 bathrooms - this luxury condo sleeps 4. A stunning view from the full-length balcony awaits your discovery of the ocean, beach, and jungle. From your balcony you can see the 'Night of the Iguana' movie set, view sunsets, watch whales, and feed the brightly-colored reef fish below - all while sipping that cool and refreshing margarita. You can rent Jet Skis or go Parasailing from the beach. Explore the jungle above Mismaloya where the movie 'Predator' was filmed. Onsite restaurants, exercise room, tennis, loads of activities - 8 golf courses, zip line, nearby botanical gardens, zoo, and numerous restaurants in Mismaloya. Activiites Galore: Rent a panga (small boat) from a local guide to travel the area or go to Yelapa. 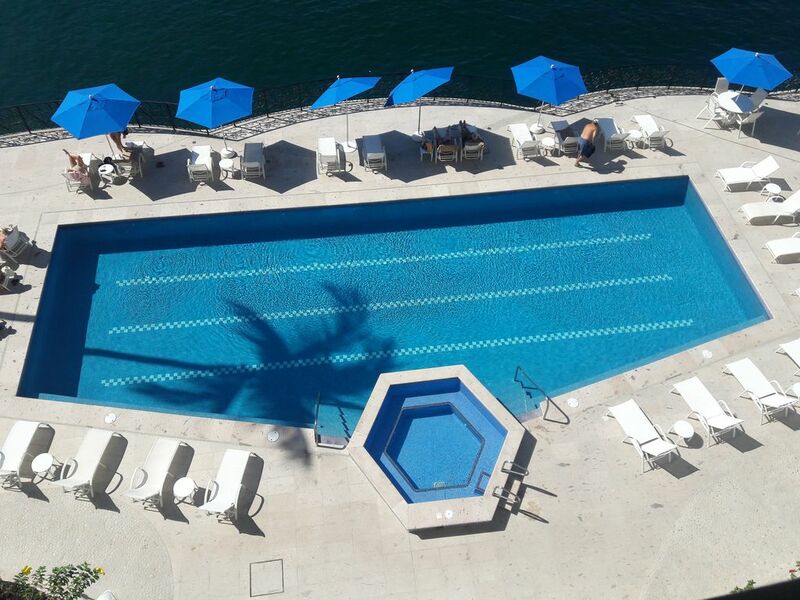 This condo complex adjoins the 5-Star La Jolla de Mismaloya Hotel. Both the condo and the hotel were built by the same design team. There are 5 restaurants at the hotel and 3 other restaurants within walking distance. One of the nearby restaurants, 'Tony's,' is in a tree house with an awesome view of Mismaloya Bay. The La Jolla de Mismaloya condo complex has a private pool, jacuzzi, exercise room, tennis, and a private restaurant at the condo pool. You won't need a car - as there's good taxi and bus service into town. The bus stops nearby in front of the condo office. Great fishing, snorkeling, surfing, sailing, horseback riding, kayaking, scuba diving (see the Manta Rays), zoo, zip line canopy tours, and beach walking. Complete Condo - everything you need : Full kitchen, satellite TV, phone, fax, maid service, property manager/concierge on site, gated community, swimming pool, restaurant by the pool, exercise room, tennis. More Activities: We send a 65-page booklet with information all about the area. Mexico is wonderful - the first thing people ask is, 'Is it safe?' We have driven all through Mexico and have had wonderful experiences from Merida to San Miguel de Allende, the Copper Canyon, Guadalajara, Zacatecas, Oaxaca, Michoacan and throughout the Puerto Vallarta region. Come experience the magic of Mexico - the food and people are fantastic and welcoming. Ocean front, onsite restaurant and bar from November through April. Local restaurants open year round in Mismaloya. Quiet, peaceful getaway. Enjoy the hustle and bustle of Old Town Puerto Vallarta during the day or night, then rest quietly in Mismaloya. Charter a panga off the beach in Mismaloya. Walk from condo to the beach. 7 golf courses in greater Vallarta area from Marina Vallarta to Vista Vallarta, Nuevo courses, Flamingos and Punta Mita area courses. Many sitting areas around pool and lounge areas outside. Shared spa and pools. Private restaurant /bar at the pool. open from November thru April. Restaurants in the village of Mismaloya, open year round. Washer and dryer in communal area. Housekeeper before and after your stay, plus one time during your stay, with a 7-night minimum.